Trapped in time consuming and unproductive meetings? Need ways to plan and run better meetings? Want an approach that works with all types of groups? You've come to the right source! Magical Meetings is a practical and comprehensive look at what makes meetings tick. It addresses not only how to set up and run a productive meeting, but also how to avoid problems and get back on track. In only 60 pages, you get a condensed and exceptionally practical guide you can use for a lifetime. Magical Meetings is based on proven techniques combined with the author's experience in facilitating task forces, work teams, committees, management team building, and training sessions. The author, Don Barkman, provides a down-to-earth guide to "doing it right" in the meeting room. Foundations: the basic meeting process, preparing agendas, and how to reach a decision. Building Blocks: member viewpoints, roles, good & bad behaviors. Mortar: brainstorming, nominal grouping, force field analysis, problem solving, meeting management techniques, follow-thru & critique. Cracks: what goes wrong & how to handle it. Magical Meetings uses easy-to-read explanations coupled with questions to help you reflect on key ideas and relate the material to your meetings. It also includes Observer’s Guides for analyzing meetings and the fantastic, one-page "Magical Meeting Manager" form that handles preparing for, conducting, and following-up meetings. 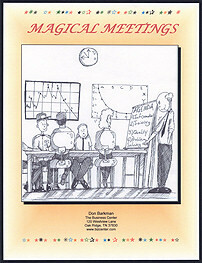 Magical Meetings is the book version of The Business Center’s Building Better Meetings seminar. The BBM seminar can be conducted in a single day or as two half-day sessions. Participants learn from group interaction exercises where they apply what they are learning. Leader’s materials are available for conducting BBM in-house. For more information on how your work teams, safety committees, task forces, and staff groups can all build better meetings, click here to order your copy of Magical Meetings or contact us today. Quantity discounts are available. Your transaction is securely processed by PayPal (you do not need a PayPal account). We'll take care of it from there!